Sourpuss Clothing's vintage-inspired Halloween pattern is perfect for adding a spooky yet kitschy accent, any time of year. I’m a big fan of Sourpuss Clothing and their spooky, vintage-inspired items, and judging by my closet, I really love their black cat print! So needless to say, I was super excited when Sourpuss Clothing sent over this black cat serving tray, candy dish, and tea towel for me to review! Please check out my video feature above, or scroll down to continue reading my review, as well as direct links to the items on the Sourpuss Clothing website. 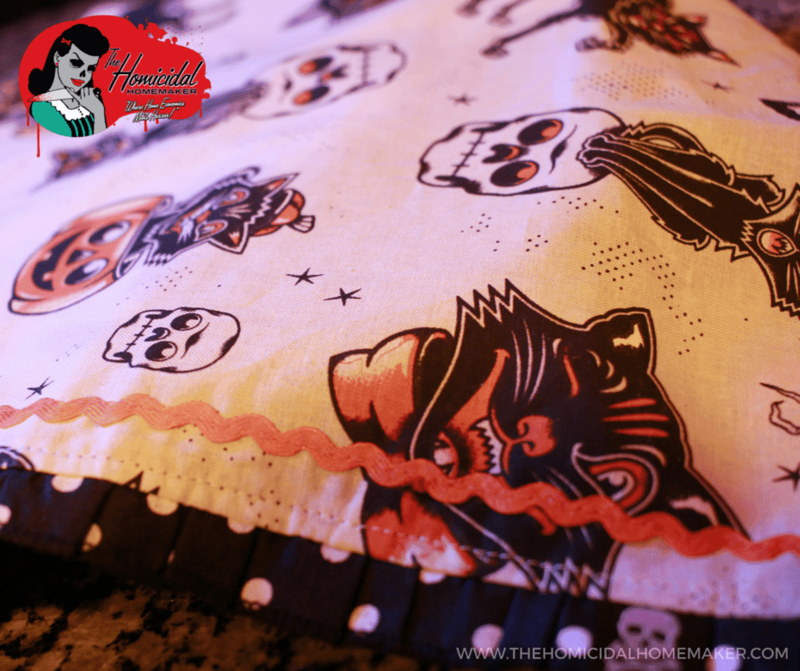 The Sourpuss Clothing Black Cat tea towel is a simple way add a little festive Halloween cheer to your kitchen. The towel is 100% cotton, measures 16″ x 26″, and features a vintage-inspired Halloween pattern with a cute polka dot trim. Hang it over your cabinet door or oven handle for a kitschy accent any time of year. 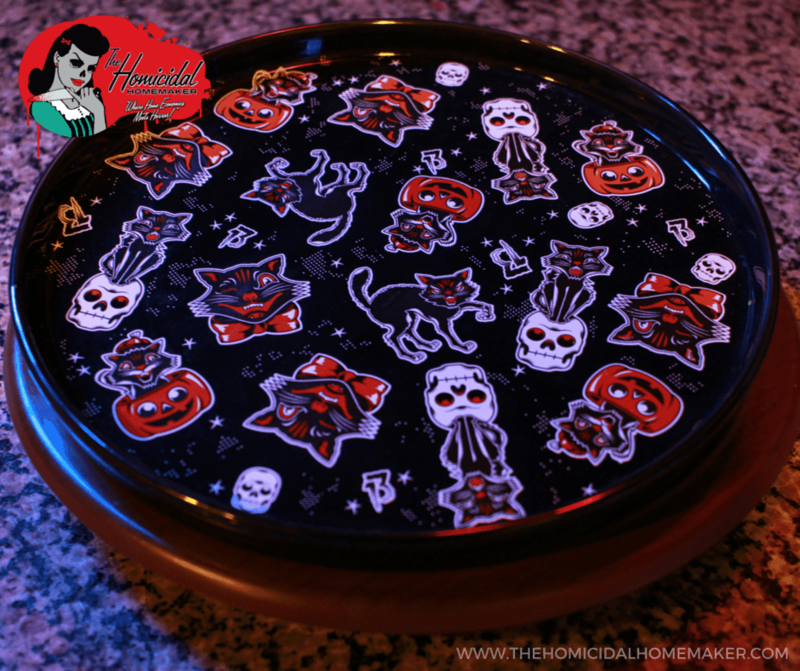 The Sourpuss Clothing Black Cat serving tray features the same awesome vintage-inspired Halloween pattern, measures 11″ in diameter, and is made out of porcelain, so it’s both microwave and dishwasher safe! 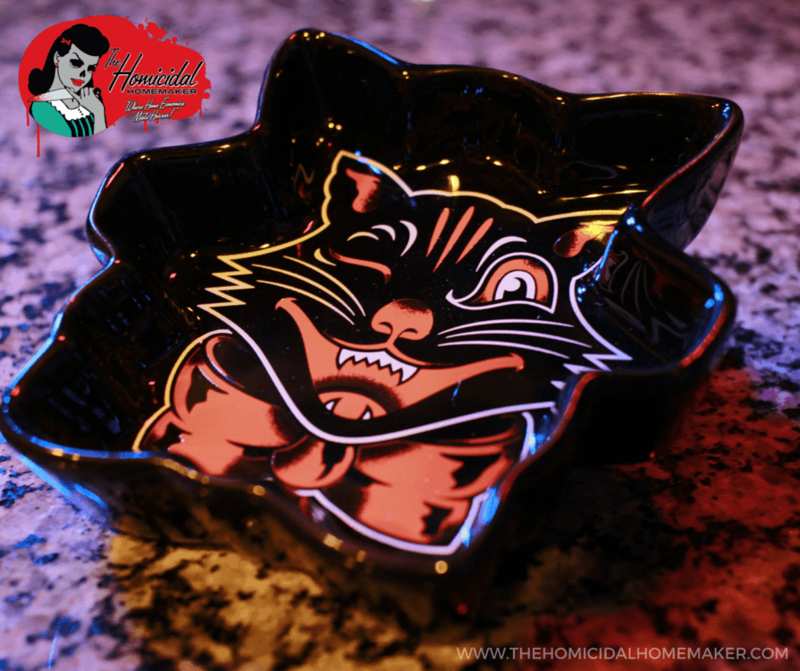 Last, and certainly not least, we have the Sourpuss Clothing Black Cat candy dish. The candy dish is also made of porcelain and is both microwave and dishwasher safe. It measures 5″ x 4.5″, so it’s the perfect size for holding all of your favorite treats! This also would made a great catchall for your desk, or on a vanity to hold your jewelry and trinkets. A huge thanks to Sourpuss Clothing for sending me these great items to review! You can get all of these items on www.SourpussClothing.com. If you’d like to dig your claws into these items, use the form below to enter to win! All you need to do is log in, be sure to ‘like’ The Homicidal Homemaker on Facebook, and subscribe to me on YouTube, but you can also get bonus entries for watching the product review, following me on Twitter, or Instagram! Next articleStay as “Cool as a Corpse” with Cookies and Scream Tombstone Popsicles!